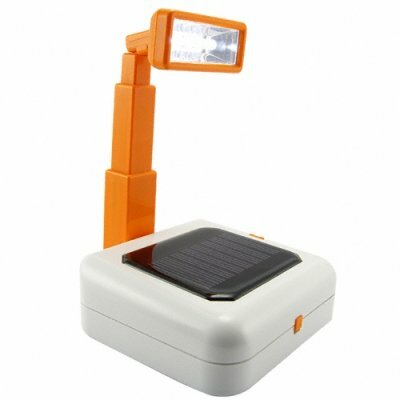 Successfully Added Small LED Desk Lamp + Portable Solar Light to your Shopping Cart. Small LED Desk Lamp + Portable Solar Light. Adjustable LED desktop or workbench light fixture that can also be folded up to be used as a portable lamp for camping and outdoors. Have a workbench where you need a little extra focused light? Need a small night light at your computer desk that will give you some extra working illumination without any glare? Need a nightlight/flashlight for when you go camping? Then we have the answer for you! This small sized adjustable LED lamp provides a focused amount of white light useful for specific task areas or to be used as a direct/indirect light source. The telescoping arm provides easy 180 degree adjustment of the light output, allowing you to put the light exactly where you want it. What makes this light fixture even better is that it is solar powered! During the day it recharges itself for you, and at night it is ready to provide you with some nice task lighting. Its small size also means that it fits on almost any cluttered workspace without getting in the way, and you do not have to find any extra electrical sockets for it to plug into! As always, this wonderful little product is offered to you at a low wholesale factory-direct price. From the leader in the latest and greatest direct from China electronic products, Chinavasion. Adjustable LED desktop or workbench light fixture - solar powered. Compact sized lamp that does not need any electrical input; great for use on cluttered desktops. Portable - can be folded up and used as a travel light or flashlight.